I have a decoupled mechatronic system with two motors. I want for each motor to give a s-curve path as reference. 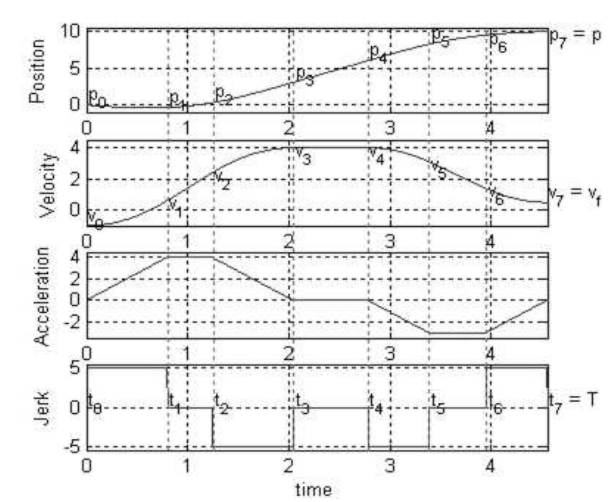 You can see in the image below the position path, velocity and acceleration. All information that I have are extracted from these plots. This seems like a fairly standard equation but I have not been able to find anything that works. 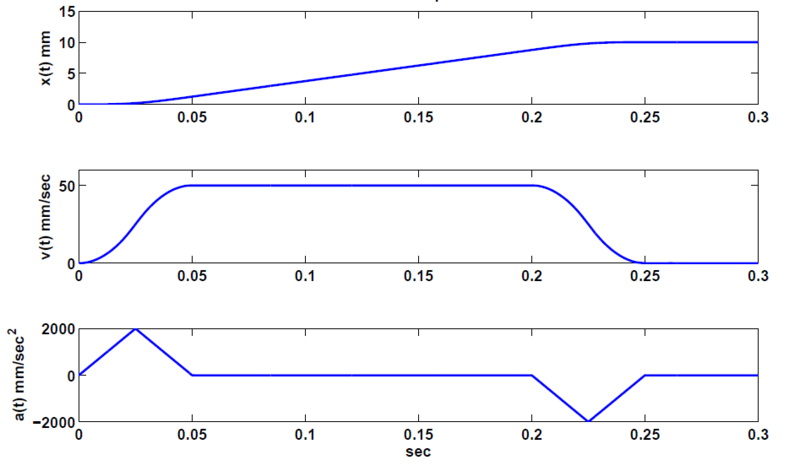 I have tried to used the equations from Constant Jerk Equations For A Trajectory Generator1 but the results where not the same. I also found Mathematics of Motion Control Profiles, and maybe I don't understand it, but the equations found there do not seems to be enough for what I want. Can anybody provide the correct equations (preferably in a generalized form, so I can apply them else where in the future) or some other help? 1 From ME EN 537 - Advanced Mechanisms/Robotics > Notes. If we now integrate $a\left(t\right)$ twice in $t$, we will get two expressions representing the velocity $v\left(t\right)$ and the position $x\left(t\right)$, respectively, that contain $10$ unknown constants in total. These unknowns can be easily retrieved if we guarantee that both $v\left(t\right)$ and $x\left(t\right)$ are continuous at the extrema of the time intervals given above. There are more possible cases that depend upon initial and final desired conditions and constraints on the positions, velocities, accelerations and jerks. While the equations are pretty straight forward, mentioned in this paper Jeong, Soon Yong, et al. "Jerk limited velocity profile generation for high speed industrial robot trajectories." IFAC Proceedings Volumes 38.1 (2005): 595-600. for almost all possible test cases, there are issues with constant jerks and other constraints that limit the feasibility of an S-curve. Not the answer you're looking for? Browse other questions tagged control motor stepper-motor motion or ask your own question. WHY are there no operating torque specifications on steppers? What dynamic system could these equations represent? Building a quadcopter, what motors, props and what are the calculations?